We bring dead sleds to life! Whoa, winter 2008/2009 has hit! 14" of snow before Christmas is pretty awesome. That said I have to confess, friends I have sinned, after the mechanical maladies of last winter I caved in and bought a newer sled, a '94 Ski-Doo Grand Touring 670. The snow gods punished me by taking away all my beloved snow right after Christmas... We're working on getting it back now but much slower this time. 2 dates for you to mark down, January 25 for the Moose Mountain Vintage Show and Ride. 107 Moose Mountain Rd, Brookfield, NH mb3660@comcast.net is the contact on that one. February 14 & 15 the NHSMA Winter Banquet and Show. The banquet is Valentines night (Feb 14 dummy!) at the Cat & Fiddle in Concord, NH. The show is the 15th at the Museum. The NHSMA website will give you all the information you could possibly need. When your wife says snowmobiles are only toys show her this picture. 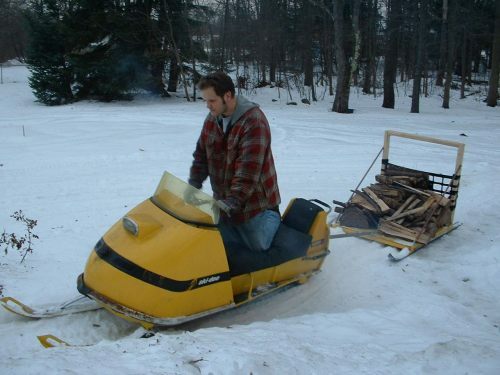 Thats my 1970 Ski-Doo 12/3 pulling the firewood sled. I need to rework the sled some, the 12/3 can haul that weight no problem, the sled is out of capacity. If you haven't been over recently take a look at the New Hampshire Snowmobile Museuem their Model T snowmobile resto is apparently done and to be unveiled at their winter show. I'll be there and will get some video of it. I think this is a great thing. Watch my NHSMA 2006 Video and you can see a similar Model T thats all decked out. Then head over to NHSMA'S Model T Restoration page and make a donation if you're able. I'd like to know what you think about these pages give me a shout with your thoughts. Click here to vote for me on the Top 100 Snowmobiling sites!